\nstimulated by Nick Beale\'s authorative thread on ULTRA, this is an attempt to kick-start discussion on the availability and use of other archived British Y-intercept material. Firstly, because my own interest concerns the Nachtjagd in the late-war period, I have not actively investigated the availability of such information on other arms of the Luftwaffe or the availability and quality of such material in the 1939-43 period. \nI will start by stating that A.I. (British Air Intelligence) produced a large number of reports based upon the collated intelligence from wireless intercepts and captured documents and aircrew. The attached PDF entitled \'Air Ministry AI Document Distribution List\' surveys the type and scope of these reports. The document is a reproduction of a document found on an A series (A5400 from memory) microfilm held by The Air Force Historical Research Agency. It lists the A.I. reports being distributed to American commands by originating directorate. I have added known British National Archives file reference numbers for surviving copies of these reports. The various surviving reports held by the British National Archives are by no means neatly organised, easy to locate via an archive catalogue search, or complete. \nA tremendous amount of Y-intercept material survives in the series AIR 51 - Mediterranean Allied Air Forces: Microfilmed Files. There appears to be material of wider interest in these microfilms, beyond just operations in the Mediterranean. The attached PDF entitled \'AIR 51 Int Sigint Index\' provides a list of the Signals Intelligence files held within this microfilmed series. Others, such as Nick Beale, would be more qualified to comment on the general content of these files. The microfilm AIR 51/292 holds an incomplete selection of A.I. reports in the BAT, OWL-ROBOT, Pearl/Zip/FT/AI, Pearl/Zip/GAA, Pearl/Zip/GAM, Pearl/Zip/LS, and Pearl/Zip/TAC/N series, and I have indexed these in the AIR 51 PDF. I would expect that other microfilms contain a wider selection of reports. \nAt least in the late-war period, these reports cover a 24-hour period ending at 0600 hrs B.S.T. or 0700 hrs B.D.S.T., depending on the time zone in use. \nAn executive summary on the first page of (a) Enemy Bomber Activity, and (b) Enemy Nightfighter Activity. Sometimes other information of interest, such as Y evidence of lost aircraft is also appended. \nPart I - Enemy Bomber and Reconnaisance Activity. This section has information under the following column headings Unit; A/C (i.e. the number of aircraft heard); Times; Control (i.e. the ground control with which the aircraft were operating); Freq (i.e. wireless frequency); Remarks. \nPart II - Enemy Bomber, Fighter Bomber and Miscellaneous Activity (V.H.F.) - when present, I presume that the format of the information is similar to Part III. below. \nPart III - Enemy Fighter Activity (Day). this section contains the following sub-sections: 1. GAF reaction to Strategic Operations, GAF reaction to Tactical Operations, and 2. information on aircraft (usually nightfighters) heard operating during the day. Part one is usually in a narrative style with a summary of Allied operations, but can include specifics such as times, type and number of aircraft heard to be operating, location, along with instructions passed. \nPart IV - Enemy Fighter Activity (Night). This section contains the following sub-sections: 1. Narrative of reactions to specific raids, and 2. Summary of messages intercepted and information on aircraft heard operating during the night. \nAnyway, this will do for a start. If anyone has further information on the Y material available, especially in non-British archives, I would be very interested to heard from you. As with ULTRA, this material in isolation does not provide some magical all-encompassing view of Luftwaffe operations and organisation, but can combine well with information from all documentary sources. Then S/L G.R. Scott-Farnie, head of Y Section in Air Intelligence early in the war once summed it up beautifully: "Intelligence is rarely dramatic - the best results are obtained from the continous study of details, which although singularly of little value are collectively of great importance." \nI\'ve added samples of some late war reports concerning Luftwaffe activity on 7 April 1945. \nPearl-Zip-BMP-D-844.jpg - the main narrative page from the Pearl/Zip/BMP/D report concerning daylight LW reaction to Allied raids. The D Reports at this stage of the war appear to be quite sparse, and certainly not as detailed as the N Reports. The report is contained in HW 13/86 at The National Archives, Kew. \nActivity Summary No 2045 Pg 2.jpg & Activity Summary No 2045 Pg 2.jpg - two pages from the report described above. The report is contained in AIR 22/503 at The National Archives, Kew. \r\nThe Operations Record Books of No. 276 Wing in AIR26/380–AIR26/383. \r\nHW41/47: Daily Signals Intelligence reports from June 1944 through to February/March 1945 (with quite a lot of them missing). You will also find isolated one-off copies of these in AIR51 and in the 276 Wing ORB — and very frustrating that is. What happened to the rest of the ones for the first half of 1944? \r\nAIR23/3479: MAAF Sigint Daily Reports, October 1944–May 1945 (these are the same reports you\'ll find in HW41/47 for the period concerned but I\'ve never cross-checked to see if it fills any of the gaps in that file). The 2nd TAF Y Intercepts for the last three months of the year are in AIR40/2371 -2373 and has its uses, primarily to back up other material rather than as a primary source. Rod. Great thanks for samples. Yes them (AAS 2045) are really useful for "full research" in certain areas, but as they never contain the actual codes (callsigns) much is lost in their "value". There are lots of these existing - I had seen sample from 10.1942 (but not had chance to look at more). \nI had no prior confirmation Westa 3 flew that far West - but am not surprised. - Part I, Para 1 (Page 2) is what date? I can look in my files and check if it was detected from ground! Some of these files are reproduced int he HW 13 series (around part 96 for bomber and recon). These have similar details and are set out in a similar fashion with the columns: unit, take-off, attack, landing, no., type, area references and other remarks. \nThe sort of information that can be gained can be as much as the following entry for 5.10.41 for 3./123: "4U+PL TO before 1100 for WR of East Coast between Yarmouth and Sunderland. This aircraft may have been the one unsuccessfully engaged by two Hurricanes 30m NE of Happisburgh between 1125 and 1230. A/C landed by 1500." Likewise it could be as little as "unknown unit. 3+?. no line." \nBe warned, a) large files that will take a long time to sort through, and b) just because a unit is listed in the above, doesn\'t mean there may be any more than a single reference of inconsequential value in the files. Thanks Nick, Steve, Ed and Adam for the information. \nEd, the sample Air Activity Report is for the 24-hour period ending 0700 B.D.S.T. on 8 April 1945, so the daylight sorties were on the 7th. Times are also in B.D.S.T. which during this period was the same as M.E.S.Z. then in use by Germany. \nAdam, thanks for the additional info. \nIt is a real shame that more of the raw intercepts have not survived (outside of the microfilmed AIR 51 files), as with knowledge of the callsigns and codes in use at the time, many very useful fragments of information could be gained. The various periodical internal reports used by the Y-organisation to update the monitoring stations on changes of LW signals procedure and the introduction of new codes and callsigns often contain snippets of raw intercepts, but they mainly serve to illustrate the richness of the information that has been lost. Many of the reports, however, do provide useful insight into the operational workings of the Luftwaffe. This page was given to me some years back. Some "callsigns" (Stkz.) have checked "true" but I have been told others do not match. I just simply whould love to have all pages. Is this in HW or Y-Service 1944 files? Hi Ed, as a guess, it looks like data prepared by A.I.3 (b) as a part of their order of battle forcasting... Sorry, I can\'t give any info on possible archive refererences; it\'s a shame you don\'t have the title page. It looks very like some lists that I found in the 276 Wing ORB Appendices. Some of you may find these pages useful. \r\nThey are extracts from subjects covered in the Western Front Committee Reports in HW14/2055, various dates in late 1942. \nI have the same problems with the October \'42 disposition files. I can open everything else, but that link I don\'t have the "necessary privileges to access". Adam & Don: try now, if no luck then I will repost them. I think it may have a been a rookie mistake on my part. \r\n" Allied assessment of German Air Force dispositions October 1942 (includes German ASR) ..."
\r\nDon, is this the one you meant? \nYes, that\'s the file that interests me. I can now pull it up on humyo. But my efforts to read it, by enlarging, saving, or printing it, does nothing but freeze my computer. Any more hints? \r\n... my efforts to read it, by enlarging, saving, or printing it, does nothing but freeze my computer. Any more hints? Yes, and I only found out by trial and error: download it. Humyo doesn\'t seem to support viewing very well. \r\nDarius, glad you find it useful. A report on the Allied view of German aircraft reporting system including the German Y service. \r\nThe subjects covered range from chain-of-command to security procedures in place for coded messages. A January 1943 summary of Operation names known to have been used by German forces, prepared by the Admiralty. \nDoes anyone know the signature of the files covering the Operation CRUSADER period in North Africa (Oct 41 to Feb 42 incl.)? \nAIR23/910, 946, 1181, 6479: HW50/42: PREM3/291/2: and many in the WO series. The operation is also part of the content of other files. \nIs there anything in particular you are looking for? \nMany thanks for the reply. \nPrimarily operational detail. I have started on the HW5 series, and have worked extensively with the WO series, HW1, and some AIR and ADM, as well as German records from Duxford. I was particularly interested in the Y-service intercepts for the period and where they could be found. \nBased on other files viewed, I think HW50/42 is likely to have sources, possibly even transcripts, but I have not seen it myself. AIR41/25 has a lot of information concerning the plans for Crusader derived from Y, and can be taken as a summary of the AI picture based on Y. If you have not seen it already, I strongly suggest \'Spies of the Airwaves\' by Hugh Skillen. He gives considerable detail about the Allied side of the North African ops. Let me know if you need access to the book. I was particularly interested in the Y-service intercepts for the period and where they could be found. If the North African Y-service was organised as an RAF Wing (as it was in Italy in 1944 under No. 276 Wing) then the ORB and Appendices may have material you want. Equally you may find other reports made by the Wing. Many thanks to both of you. The tip on the Wing is good, I\'ll look into this. Air 41/25 looks very very promising. I wonder if that could be part of Tedder\'s \'missing\' despatch? IIRC the presecessor of No. 276 Wing in the Med (i.e. before Autumn 1943) was No. 329 Wing but I don\'t know if they were there as early as the Crusader period. Hi Andreas/Nick: I have so far had no luck finding any \'mother lode\' files of signals from North Africa. There are several files that give great descriptions of the Units and their organisation, but (I think) the daily output was handed straight to the AI officer who incorporated the findings into his reports. \nI will bet someone reading this says something like \'... but don\'t they know about ...\' and Hey! Presto! the key document is identified. How about, as a suggestion, the people who have spent time looking for this information compare notes? It is always irritating to find that one has followed the wasted journey of another, and likewise rewarding to find that something already viewed is useful to someone else: I will gladly donate some on-line storage space to housing any files others want to share. \nMaybe nothing will come of it, but what do others think? Good idea, and I wish I could contribute to that. \nAs for 329 Wing, a quick trawl of the Catalogue at the National Archives shows no mention before 1943. This may help a bit? 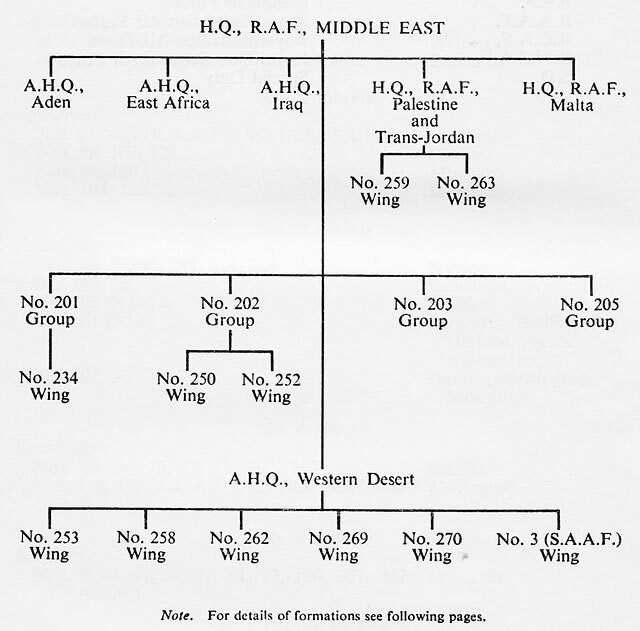 From the OH, organisation of RAF Middle East on 11 November 41. \nNo. 250 and this wing is not given with any aircraft type. \nBut... I can\'t find any records in the National Archives. The pages in my earlier posts may soon disappear as I am cancelling my Humyo online storage account. It is unclear whether they will stay accessible via the links or whether they will vanish altogether, so if anyone wants to see them I suggest they do so in the next week. This also goes for the pages linked in the Using Ultra to research the Luftwaffe forum where I am posting a similar message. \nI hope this is not a problem to anyone. Please PM me if in the future you want access to the documents and I will do what I can. Last edited by Darius; 7th March 2010 at 23:41.